Passed away peacefully 2nd April 2019. Beloved husband Romanina for 60 years. 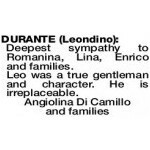 Loved father of Lina, Diana (dec) and Enrico. Father-in-law to John, Robert and Leonie. 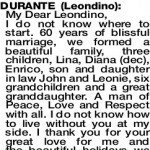 Adored Nonno to 6 Grandchildren and Bis Nonno to 1 Grand- daughter. The family would like to thank Dr Di Camillo, Dr Chakera and the Stirling Dialysis Clinic for all their support and assistance. 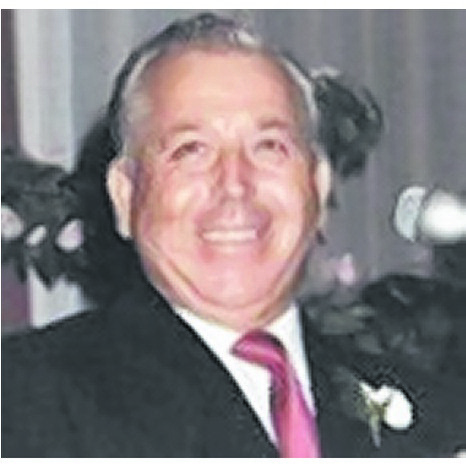 The Funeral Mass for Mr Leondino Durante of Balcatta will be celebrated in St Lawrence's Church 392 Albert Street Balcatta commencing at 10:15 am WEDNESDAY (10.04.2019) The cortege will leave the Church at the conclusion of Mass and arrive at the main entrance of KARRAKATTA Cemetery, Railway Road, Karrakatta at 12:15pm for a Burial Service. Vigil Prayers and Rosary will be recited in Bowra & O'Dea Chapel, 502 Wanneroo Road, Westminster at 7:00pm on MONDAY evening (8.04.2019). I do not know where to start. 60 years of blissful marriage, we formed a beautiful family, three children, Lina, Diana (dec), Enrico, son and daughter in law John and Leonie, six grandchildren and a great granddaughter. A man of Peace, Love and Respect with all. I do not know how to live without you at my side. I thank you for your great love for me and the beautiful holidays we shared with our family. Please give Diana a big hug and many kisses from me. I loved you since I was sixteen and I will love you forever. Thank you for all the times I have needed you most, for all your loving care throughout the years. You touched my life, shared my days. I will cherish it all, your songs, your jokes, your protection, your warmth. You were the best Dad, the best Nonno and the best Nonnino. I will never underestimate how incredibly fortunate we have been to have had you in our lives. The perfect role model, mentor, Dad and Nonno. You worked so incredibly hard to make sure the family had an abundance of food, love and laughter. Your beautiful traditional family values are so deeply entrenched into our lives and will be your legacy, for that we are eternally grateful. You maintained your amazing sense of humour and showed all you were in the fight for life, love and laughter right to the end. We are devastated to lose you, but we will always cherish our memories with you. The school holiday stays, the slow drives to Sizzler, the jokes and endless nicknames, the laps around the stairs, your songs, and most of all your cheeky, effervescent spirit. We will miss you at the head of our dinner table, your leadership on sauce and wine day, the tune of Arriverderci Roma, your measured pace, even when we're in a hurry, and yes, even the lectures. You taught us the true meaning of family and we will miss you dearly. 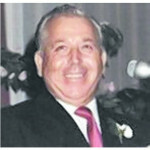 DURANTE LEONDINO Our heartfelt sympathy to the Durante family on the passing of Leondino. A big heart, always with a smile. will be missed. Maria, Ermano, Elia Erneste and family. 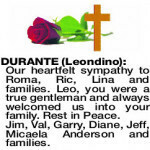 DURANTE LEONDINO Heartfelt sympathy to Romanina, Lina, Enrico and families. Leo was a true gentleman of great character. 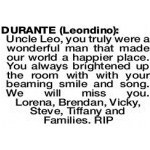 In loving memory of our Uncle Leo. Everything you did was for your family. Your love and laughter will never be forgotten. 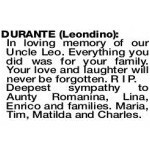 R I P.
Deepest sympathy to Aunty Romanina, Lina, Enrico and families. Maria, Tim, Matilda and Charles. 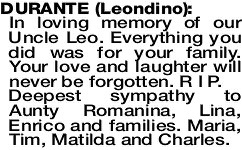 Deepest sympathy to Romanina, Lina, Enrico and families. Leo was a true gentleman and character. He is irreplaceable. 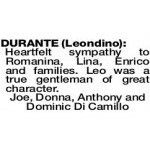 DURANTE LEONDINO Deepest sympathy to Zia Romanina, Lina, Enrico and families. 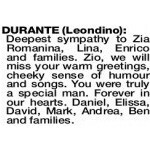 Zio, we will miss your warm greetings, cheeky sense of humour and songs. You were truly a special man. Forever in our hearts. Daniel, Elissa, David, Mark, Andrea, Ben and families. 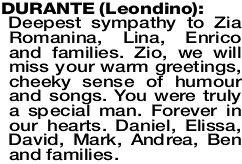 DURANTE LEONDINO Heartfelt sympathy to Zia Romanina, our cousins Lina and John, Diana (dec) and Robert, Enrico and Leonie and extended cousins on the sad loss of your loving husband, dad and nonno. 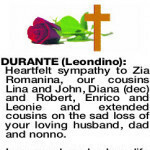 Deepest sympathy to my Sister Romanina, Lina, Enrico and Families. 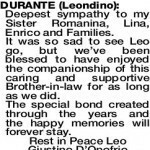 It was so sad to see Leo go, but we've been blessed to have enjoyed the companionship of this caring and supportive Brother-in-law for as long as we did. The special bond created through the years and the happy memories will forever stay. 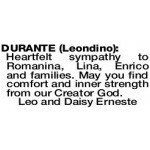 Heartfelt sympathy to our dear Sister Romanina, Lina, Enrico and Families. How do we begin to describe such a gentle, caring and loving gentleman. In his journey through life, Leo's kind heart touched so many people and they are all richer for it. He was respected and admired by all who knew him. To us he was our wise Brother-in-law, mentor, dear friend and much more. So many happy memories to cherish. Thank you. 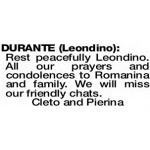 Heartfelt sympathy to Romanina, Lina, Enrico and families. May you find comfort and inner strength from our Creator God. 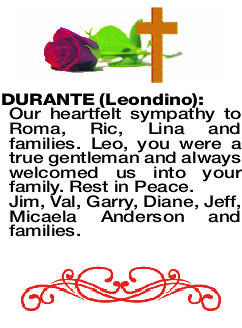 DURANTE LEONDINO Our heartfelt sympathy to Roma, Ric, Lina and families. Leo, you were a true gentleman and always welcomed us into your family. Rest in Peace. Jim, Val, Garry, Diane, Jeff, Micaela Anderson and families. 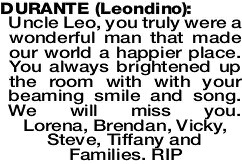 Rest peacefully Leondino. All our prayers and condolences to Romanina and family. We will miss our friendly chats.